As we continue through the track season, we have reached the pinnacle of act 1: the Indoor State Championships. We have seen some impressive individual accomplishments and team relay times over the last 2 months. It all comes down to this Saturday, February 16th, to see who brings home the trophies. We will first preview Division 1, large school division. This encompasses Class 4A and 5A. While we haven't seen the final heat sheets yet, this is our preview based on the current rankings in the state. Field events kick off the meet at 10am. 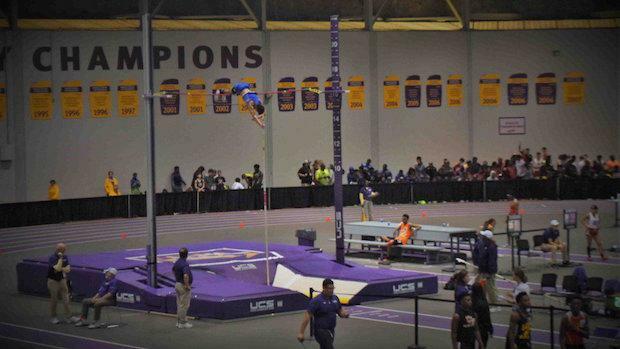 The girls pole vault looks to be in the hands of none other than Johanna Duplantis (Lafayette). Right on her heels though are Heather Abadie (St Michael) and Gaby Bird (Fontainbleau). In the girls high jump, there is a trio tied at 5'6". Alacia Myles (Edna Karr), Chadlyn Gladney (Barbe), and Taylor Davis (Benton) will see who can top the podium. The girls long jump is headed by Diamond Smith and Cameron Goodman, both from (John Curtis). The triple jump looks to be a showdown between Amy Warren (Belle Chase) and Orsciana Beard (Zachary). Cameron Goodman (John Curtis) could also be in the mix. The shot put should go to Logan Lewis (Baton Rouge High). On the boys side of the field, Clayton Sims (Live Oak) leads the field in the pole vault with a mark of 15'6". Right behind him is Elijah Odinet (Lafayette) at 15'5.75". In the high jump, unless a miracle occurs, this one is all Chris Hilton (Zachary). No one is close to his mark of 6'10". The long jump is headed by CJ Hill (St Thomas More) followed by Joshua Mason (New Iberia) and Reginald King (Scotlandville). The triple jump has Donald Jones (Broadmoor) as the only person to best 45' so far this year. His competition could come from a wide open field of Reginald King (Scotlandville),Devin Coatney (St. Augustine), Jared Jackson (Edna Karr), or Stephen Rogers (Ruston). The favorite in the shot put should be Zechariah Blake (John Curtis), although Johntrell Steward (Breaux Bridge) could give him a run. The relay events are where it gets fun. The girls 4x200m should be a showdown between Lafayette and John Curtis, with Zachary, Ruston, and Edna Karr in the mix. In the boys 4x200m, Westgate holds the top time of 1:29.66, but Ouachita Parish, Catholic High, Edna Karr, and Ruston could challenge. One of the best races in track is the 4x400m. The girls race is lead by John Curtis with a time of 4:03.66. But look for Ruston to pressure if not win this race. On the boys side, Catholic High holds the top spot with a 3:27.58. Look for competition from the same schools in the 4x200m plus Byrd, Landry-Walker, and Scotlandville. My personal favorite relay of the day is the 4x800m. It's hard to find four legs who can hammer an 800m. But in the girls 4x800m, St. Josephs has it. This race won't be close. Nobody can touch their time of 10:05.59. Where it gets interesting is the boys 4x800m. St Paul's edged Catholic High by 0.04 seconds at LSU Last Chance Meet. Look for another showdown with Brother Martin, Ruston, and Lafayette also vying for the podium. The sprints are fast and furious. The girls 60m dash is lead by Kiana Foster (Loranger) followed by Ariane Linton (Dutchtown). The 60m hurdles crown should go to Shantavia Davis (Captain Shreve) or Orsciana Beard (Zachary). The girls 400m is lead by Maygan Shaw (Pineville). Right now she is the only girl to go sub 59 seconds this year in division 1. Four more challengers in the field could be Indya Jackson (Zachary), Faith Outing (Leesville), Jada Williams (Ruston), and Aaliyah Allen (Carver Academy). On the boys side of the sprints, defending champion Corey Wren (John Curtis) is the favorite. He and Trejun Jones are the only ones in the field to go sub 6.9 seconds so far this year. The leader in the 60m hurdles is Kai Hensley (Woodlawn), but right on his heels is Timothy Cola (St Augustine). Top spot in the 400m goes to DJ Butler (Catholic). He is the only one to go sub 50 seconds in the field. Look for a challenge from Maliek "Wu" Roberson (Ruston) and Kayshon Boutte (Westgate). The distance races boast some serious talent! In the girls 800m, Laila Jackson (John Curtis) should take control of this race. Taylor Winters (St Josephs) could challenge, and I would be wrong not to mention Brynn Kelso (Vandebilt Catholic). She is an 8th grader running 2:29.33 already! For the boys 800m, all I can say is flip a coin. Ladan Thomas (Byrd) is a beast and is the favorite. But I've seen Collin Hedges (Catholic High) run down some serious talent, so don't count him out. Challenges could come from Marshall Buhler (Fontainbleau), who can run any distance race, Londyn Roberts (New Iberia), and Taejon Morris (Airline). For the girls 1600m and 3200m, there is one school: St Josephs. Currently I don't know which two will be running which race, but you can take your pick from senior and LSU signee Lauren Hendry, Isabelle Brown, Virginia Dirks, Sophie Martin, and freshman Maddie Gardiner. St Josephs has these two races on lock! I have to mention some freshmen who have posted some impressive times this year in Lexi Guidry (Teurlings Catholic) 5:33.63, Laila Jackson (John Curtis) 5:36.39, and Marina Givens (Ruston) 5:39.34 and 12:16.65. In the boys 1600m and 3200m, there is one name: Hunter Appleton (Brother Martin). He is the favorite in both races, but could see a challenge from Marshall Buhler (Fontainbleau) in both races. Others looking to podium could be Collin Hedges (Catholic), Christopher Cuntz (Catholic), and Patrick Elliot (St Pauls) in the 1600m, and James Lalonde (Catholic), Owen Simon (Catholic), and Samuel Avants (ED White) in the 3200m. For the team competition, the girls state championship will be a battle of St Josephs versus John Curtis. Distance versus speed and jumps. This will be fun to see how this plays out throughout the day. Zachary has a good team also, but don't know if they have enough to get in the mix for the team title. For the boys team competition, all their cars and buses would have to break down. All Uber drivers would have to be busy. And they would literally have to not show up for Catholic High not to win. The real fun will be to see who gets the runner-up trophy. Second through fifth is separated by 6 points. We will see who wants it the most between Brother Martin, John Curtis, Fontainbleau, and Ruston. Good luck to all the teams this weekend and congratulations on a good season so far! We will be broadcasting live Saturday, starting at 1pm. See you at LSU!! !